Musicians have long been drawn to the American South. Since the 1950s, the renown of locations such as Memphis, Nashville and Muscle Shoals – each with their deep musical histories, famed recording complexes and resident session players – has attracted artists looking to establish their career, reinvent their sound, and connect with a musical lineage that stretches back generations. When The Black Keys’ Akron-born frontman Dan Auerbach moved to Nashville in 2010, he was acutely aware of its musical significance. A fan of Americana and the various musical styles that feed into its aesthetic, Auerbach decided to set up a studio in its downtown district, influenced in part by the studios ran in Memphis by Stax records and Sam Phillips decades earlier. He equipped his studio for both analog and digital recording, focussing on creating an environment for live performance, where traditional recording values could be honoured. Soon thereafter, Nashville-based engineer David Ferguson began introducing Auerbach to the songwriters and session players who’d helped define Tennessee music since the fifties and sixties. Their sessions began rolling and before Dan knew it, a label and something of a ‘house band’ in The Easy Eye Sound Revue had materialised. Meanwhile, Night Beats — a band with roots in Texas and connections to Seattle — had their own appreciation for the music that has originated and developed in the south. While Auerbach’s penchant was for bluegrass, blues and rockabilly, Night Beats frontman Danny “Lee Blackwell” Rajan Billingsley had a deep affinity with southern soul and R&B. On earlier albums such as Sonic Bloom, it was just an undercurrent – their sound closer to The 13th Floor Elevators’ Bull of the Woods than Clarence Carter’s Testifyin’. But as Danny confirmed in a 2016 KEXP interview, the band’s name derived from Sam Cooke’s soul and R&B classic Night Beat, and the acts he’d have loved to collaborate with most of all were the southern soul greats who came shortly after Cooke: James Brown & The Famous Flames, Lee Moses and The Mighty Hannibal. It’s on Night Beats’ new record, Myth of a Man, that Auerbach’s Easy Eye experiences and Danny Lee Blackwell’s love of southern soul and R&B culminate. Recorded at Auerbach’s Easy Eye sound, with Auerbach in the producer’s chair and a range of the Nashville session players — whose own careers tie deeply into recent Tennessee music history — in the live room, it hears Night Beats unashamedly harnessing the hallmarks of R&B more confidently than ever. New single One Thing, for which a new video was released last week, builds around the classic E, D, A progression, with a sprightly R&B drum groove, the Easy Eye honky tonk upright and some gospel-rooted backing vocals all feeding into the authentic southern flavour. On albums cuts like (Am I Just) Wasting My Time, those soul influences are all the more present, yet tracks like Eyes on Me reaffirm their penchant for garage rock grit. 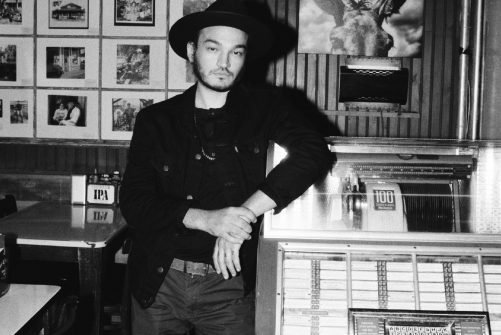 In working with Auerbach in Nashville, Night Beats have progressed — even reinvented their sound — as everyone from Dusty Springfield to Primal Scream did on their pilgrimages to the studios of Memphis, Nashville and Muscle Shoals. It’s clearly a record Danny Lee Blackwell and company are proud of and one that will certainly translate well to the live arena, bringing ebb and flow to their widely-acclaimed live sets. Night Beats play live at Band on the Wall on 7th February, supported by Witch Fever and Calvin Love. Find out more and pick up tickets here.